As every kitchen is different and every cook has their own preferences on style and function, domino hobs allow you to mix and match options to get the perfect fit. Whether using the fine control of gas, rapid heat transfer of ceramic or the smart technology of induction hobs, which heats the pan directly using magnets, you can design your own style and results. You can even install something more unusual like a fryer, griddle, barbecue or tepanyaki style hob if you want even more choice and flexibility. Call Our Miele Trained Specialists For Advice! This superb 38cm wide PowerFlex domino induction hob from Miele is finished in black glass. Versatile and fast, the two cooking zones, including a PowerFlex area, can heat up large cookware quickly. In a hurry? The TwinBooster rapidly accelerates the cooking process with 7,400 watts. Another handy added feature is the Stop & Go function. At the press of a button you can reduce power levels to one, so that food doesn't burn on or overcook whilst you pop out of the kitchen. It's elegant design is suitable for raised or flush fitment. 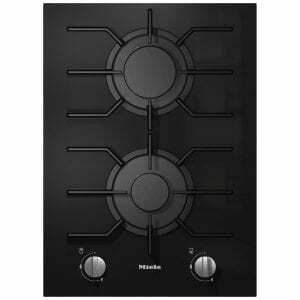 This superb 29cm wide gas hob from Miele boasts two gas burners with cast iron pan supports. Finished in stainless steel it will look great in any kitchen. 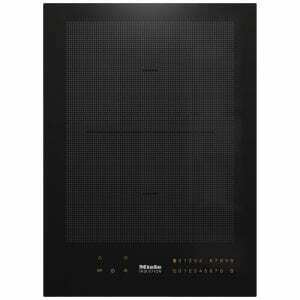 This superb 38cm wide tepan yaki domino hob from Miele boasts two heat zones. The Stop & Go feature allows you to reduce heat to lower power so that food doesn't burn or overheat whilst you are away from the kitchen. Simply press the sensor to resume cooking at the previous level. Cook food directly on the stainless steel surface and use the two seperate heat elements to keep food warm or to cook at different temperatures. You can expect a quick heating up time thanks to the induction heat elements. This versatile appliance is designed for wowing your dinner guests! Finished in black glass and stainless steel it would be a stylish and practical addition to any kitchen. 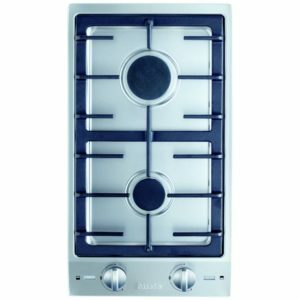 This superb 38cm wide domino gas hob from Miele boasts a dual control gas wok burner with cast iron pan supports. This wok burner can be installed flush or raised to match the rest of your appliances; any of the other SmartLine elements will seamlessly match. Finished in sleek black glass with simple, minimalist knobs this wok burner will look great in any kitchen. Easy to clean, the ComfortClean pot rests are dishwasher safe. 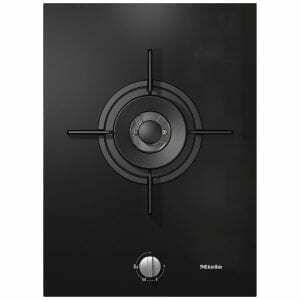 This superb 38cm wide domino gas hob from Miele boasts 2 gas burners with cast iron pan supports. The two burners are medium and large in size, making it versatile to use. The ComfortClean pot rests are dishwasher safe making it easy to clean. Designed to seamlessly integrate with any SmartLine element, this hob can be installed flush or raised to suit you. Finished in black glass it will look great in any kitchen. 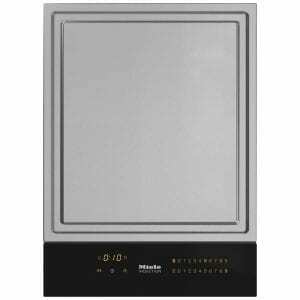 This superb 38cm wide induction hob from Miele boasts a single recessed wok heat zone. The intuitive and quick to use SmartSelect means you can use different temperatures for different cooking zones with ease. Someone at the door? You can use Stop & Go to reduce cooking power levels to one at the touch of a button. This is just as easy to bring back to full temperature. 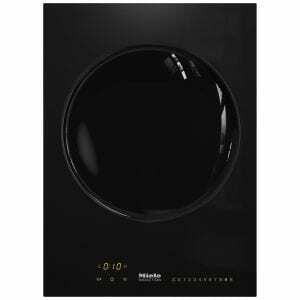 Finished in black ceramic this Miele induction hob will look great in any kitchen. If these aren’t quite for you, but you’re still looking for a new hob, then don’t worry. We’ve got lines of ceramic, induction, gas, mixed fuel and even air venting induction hobs for you to look at. They’re all in our cooking section alongside our range cookers and built in ovens. If you’re after a hob, then you may also be in the market for a matching cooker hood. We have plenty of powerful hoods in our extraction section. Your home deserves the best of the best and we stock it all at Appliance City. With our Multibuy feature, you can shop and buy across the board and update all the gear in your home all at once. See if you can’t grab yourself a bargain or two when you buy online today at Appliance City!